Join us for the next 28 days as we celebrate these outstanding Black authors and illustrators! And please spread the word. They deserve maximum shine. 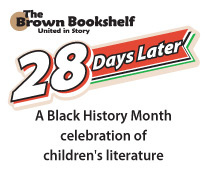 *Through 28 Days Later, our Black History Month celebration of children’s book literature, we applaud and center Black authors and illustrators. Beginning February 1, we’ll feature a Black children’s book creator each day, ending with a conversation about young adult novels on February 28. Thank you for celebrating them with us–this month and every month!